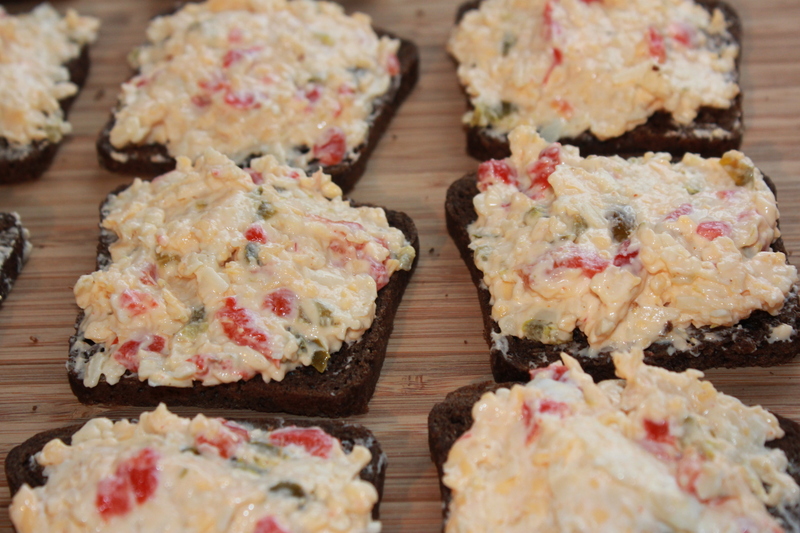 If you are from the South, chances are that pimento cheese has been a staple in your diet since you were old enough to eat it. You probably have a family recipe, handed down from your mom or grandmother, that is oh, so good and easy to make. 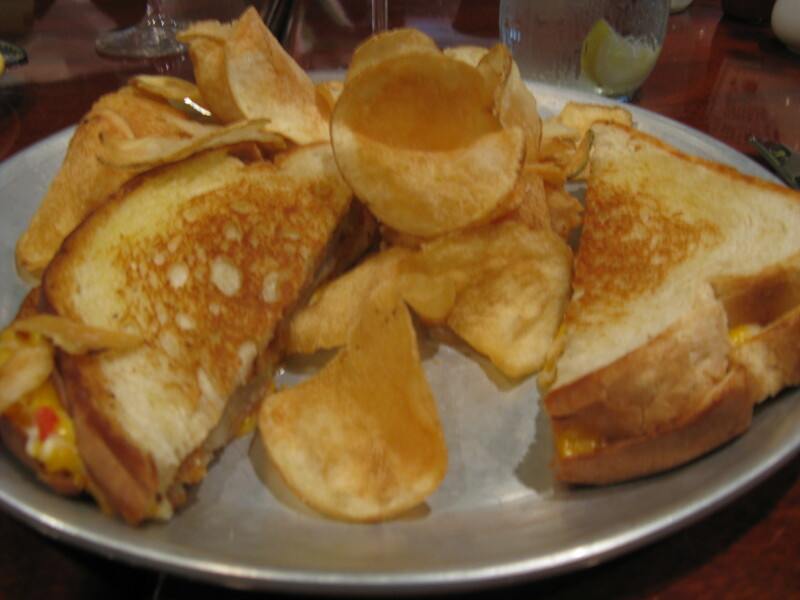 It’s great to see that a number of area restaurants are including pimento cheese on their menus, either as a dip, sandwich filling or burger topping. All I have to say to Triangle chefs is “Yaaaay” for including a little bit of heaven to some of your dishes, like this grilled fried green tomato and pimento cheese sandwich from Relish Cafe and Bar in Raleigh! This entry was posted in Appetizers, Low fat, Recipes, Vegetarian/Vegan and tagged Celery filled with Kel's pimento cheese, eat drink and be merry, grilled pimento cheese sandwiches, kel's cafe of all things food, Kel's pimento cheese, Kelley Chisholm recipes, reduced fat jalapeno pimento cheese recipe, Relish Cafe Raleigh NC pimento cheese, spicy pimento cheese, spicy pimento cheese party sandwiches on January 21, 2013 by kelleychisholm. This entry was posted in Appetizers, Low fat, Recipes, Vegetarian/Vegan and tagged Celery filled with Kel's pimento cheese, eat drink and be merry, grilled pimento cheese sandwiches, kel's cafe of all things food, Kel's pimento cheese, Kelley Chisholm recipes, reduced fat jalapeno pimento cheese recipe, Relish Cafe Raleigh NC pimento cheese, spicy pimento cheese, spicy pimento cheese party sandwiches on January 21, 2013 by kelscafe. 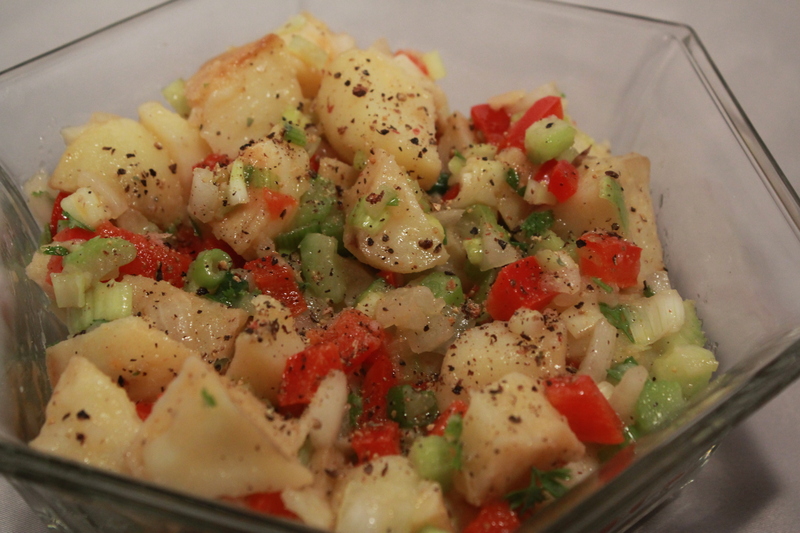 Do you love potato salad but don’t care for the mayonnaise that most recipes call for? Here’s a great one for you to try. I have to admit that I love mayonnaise in my potato salad and was skeptical to make this salad earlier this summer, when I went on a vegan diet for several weeks. Well, I’m a skeptic no more – this stuff rocks! And now that it’s football season, it makes a great tailgating dish, especially here in the south where it’s still hot outside on game day. This entry was posted in Low fat, Recipes, Vegetarian/Vegan and tagged eat drink and be merry, kel's cafe of all things food, Kelley Chisholm recipes, No Mayo Potato Salad, no-mayonnaise potato salad, roasted red potato salad no mayo, vegan potato salad, vegetarian recipes on October 4, 2012 by kelleychisholm. Looking for a salad that’s just as good in the fall and winter as it is in the warmer months of the year? 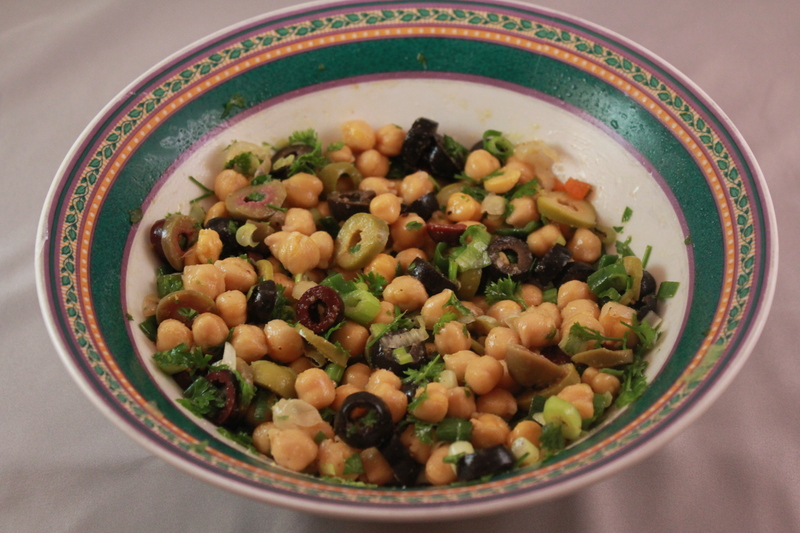 Then try this easy-to-make and hearty garbanzo bean and assorted olive salad, which is great as a stand-alone meal or side salad, especially with Mediterranean food. The garbanzo beans have a wonderful nutty taste and buttery texture that pair well with the saltiness of the olives and the tanginess of the lemon and vinegar. It’s a fantastic combination of flavors. Garbanzo beans, also known as chickpeas, are low in fat and a good source of zinc, folate and protein. Pair them with your choice of olives (which have a high monosaturated fat content that has been associated with reduced risk of cardiovascular disease) and you have a tasty salad that also is good for you! This entry was posted in Low fat, Recipes, Vegetarian/Vegan and tagged bean and olive salad, chickpea salad, eat drink and be merry, garbanzo bean olive salad, garbanzo bean salad, kel's cafe of all things food, Kelley Chisholm recipes, olive salad on September 20, 2012 by kelscafe.